New Orleans was once at war with herself and that war lasted some thirty years. The elite of the city were pitted against the powerful and long-entrenched underworld of vice, perversity, and crime. Tom Anderson ran the city—he was the czar of Storyville, the red light district in the middle of town and he fought hard to keep his empire going even while being attacked from all sides. This early-20th-century battle centers on one man: Tom Anderson, the undisputed czar of the city’s Storyville vice district, who fights desperately to keep his empire intact as it faces onslaughts from all sides. He was surrounded by prostitutes, crusading moral reformers, dissolute jazzmen, ruthless Mafiosi, venal politicians, and one extremely violent serial killer, all of whom battled for primacy in a wild and wicked city. Yes, my friends this was once New Orleans. While author Krist writes of New Orleans’ vice wars as well as New Orleans’ soul and he celebrates New Orleans’ character. She is a city that has a history of defiance and resilience and as we saw after Hurricane Katrina she can return from almost total disaster. This is the story of New Orleans as she learned how to fight. The story chronicles the history of the city from 1890-1920 and it brings up the shadiest, sexiest and most shameful parts on the history of the city that care forgot. Actually what we read about here could still be going on today. Today there is police corruption, a mayor who promised to root out corruption and fix the police department and is now sitting in jail himself having been found guilty of corruption and that is what makes this book so interesting— the fight for New Orleans is still going on. Author Krist takes on a big, corrupt city and profiles its most violent era— a time when grandchildren of former slaves are now reaching adulthood, and see an entire new world unlike that of their grandparents. There were intense race riots targeting innocent blacks that were egged on by the ruling whites. This narrative starts out with two murders. One victim is the brother of a popular prostitute, the other is the police chief himself. Italian “Dagos” are blamed for the murder, although no juror could prove without a doubt Justice is taken into the hands of Italian-hating mobs that storm the prison. With this f New Orleans police chief Tom Anderson, a man who seemed to foment racial hatred but who was no more a product of the times as the people he was sworn to protect, began his tenure. These early mob riots were the vanguard of the Black Hand over a decade later. The book is divided into four parts: from 1890-1891; mid 1890s to 1907; 1907-1917; 1917-1920. The stories in each may not relate directly to each other over the years, aside from police chief Anderson being in charge and instead of keeping the city safe, he and his friends between involved in corruption. Anderson was a flawed man, and his madam friend Josie Arlington kept the part of New Orleans known as Storyville alive with a sexual liberty unknown in the rest of the country, and it is in Storyville that so many of the crimes described in this book play out. I remember that as I was growing up in New Orleans, there were still many Storyville tales to go around. While crime was on the rise so was jazz. It was considered to be the music of the untrained or uneducated and as we read the stories we hear the music in our heads. The city’s music and music makers were part of the action. 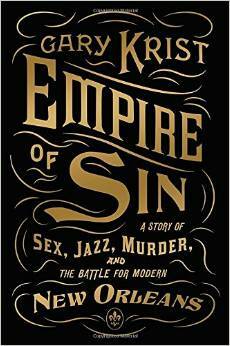 This is how jazz and cornet player Buddy Bolden came to be born,(albeit with a short career) and jazz gets entwined with stories of crime and passion in a city that had in many ways been one of the more liberally sexual cities at the time. Jazz was played in the saloons where much of the violence originated, and therefore was at center stage. The story moves on to the characters. By 1907 Sicilians came to New Orleans and they brought in the era of the Black Hand. While this is almost like reading a novel it is also, because of the tremendous research done, a biography of a city beset with racial and ethnic problems. The death of Anderson did not end crime in New Orleans, it only helped it spread across the bigger cities as the Sicilians gained financial support in the 1930s and beyond. In 1918, Italian grocers Joseph and Catherine Maggio were murdered. This was the work of the infamous Axman and, in order to explain what led up to these events, we are then taken back to the beginning of 1890 when New Orleans was seen as distressingly exotic, morally corrupt and with intense racial divides. We follow the stories of certain characters, such as Josie Lobrano, a brothel owner who craved respectability and did all she could to shield her young niece Anna from discovering the reality of how she made her money, Tom Anderson the unofficial ‘mayor of Storyville,’ and musicians such as Buddy Bolden and Louis Armstrong. Through their stories, and many others, we learn of the battle with the mafia, kidnappings, racial segregation, vice and the beginnings of jazz. However, this is not a judgmental book in any way – we sympathize with those whose livelihood was reliant on the sinful side of the city, as well as the reformers. The book ends with the infamous spate of murders by the Axman, with families attacked as they slept and bringing fear to the city. This is quite a read and for me it brought many memories of my younger live in New Orleans where everything happened and no one cared. This entry was posted in Hurricane Katrina, Uncategorized on November 11, 2014 by Amos.